Their eyes glanced level, and were fastened upon the waves that swept toward them. and all of the men knew the colors of the sea. It is cold. An unusual snap of winter grips North Florida but doesn’t extend to Fort Lauderdale. It’s two different climates. Ours is controlled by the Gulf Stream, warm, tropical, breezy and did I say warm? So on January 24, with the boat safely tied to a pier in Titusville, we head north for another installment of our “get the boat to Fort Lauderdale” saga. The marina had informed us that we had to move Catmandu to a different slip, so we decided to move it to a different slip 100 miles south. For me, the cold wind would be a surprise. 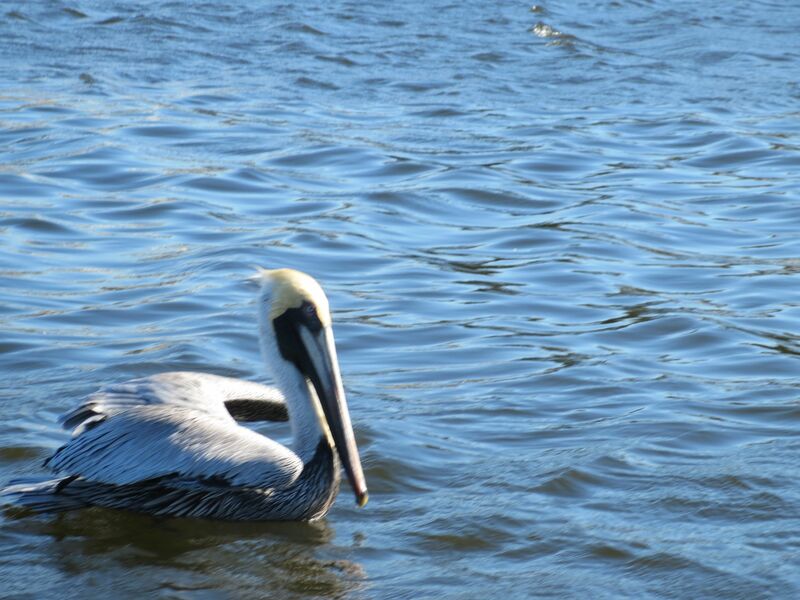 We rent a car in Fort Lauderdale and drive two cars north to the marina in Vero Beach. 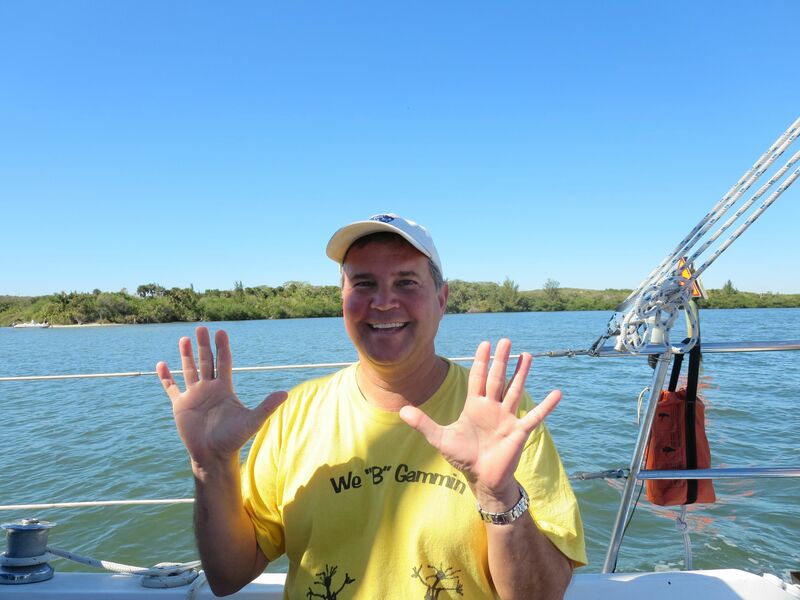 We drop the rental car there, make arrangements for a mooring, and continue 84 miles north to Titusville. We remembered to bring the boat cushions with us, because we had been sleeping on them at home. My furniture is in hiding somewhere between New Hampshire and Florida, with an expected delivery date still a week off. Sleeping on sheets on the floor gives us the world’s largest king size bed but it is a little hard on my hip bones and shoulders. On our last trip, we had borrowed the boat cushions for the apartment. So, we park the car in Titusville, load cushions and provisions onboard, and get ready to set off in the morning. It has been a while since I’ve spent the night on Catmandu and I feel a sense of homecoming as I step into the cockpit and then down the ladder to the salon. It is cozy here, a little cave of warmth and comfort. It looks, smells, feels like home. We curl up in the v-berth and sleep. Rain falls during the night, and the face-chilling drizzle continues into the daylight as we carry our steaming coffee cups up to the cockpit. I have to go back down to grab a foul-weather jacket. Our “foulies” are both warm and waterproof. With no help from dockhands, we cast off lines and back out of the slip, round the point to the east and turn south into the ICW. The water is slate-gray and choppy, and the sky is overcast. The standing joke – “I think it’s getting brighter!” – really works today as the rain lets up and the clouds separate, revealing patches of blue. We can sail here! Phil pulls out the genoa and we motorsail most of the day, speeding along at over 5 knots (a real speed-fest for Catmandu!). Coming to the first bridge of the day, we experience what a cold front really is, as the wall of wind comes in from the west and suddenly spins the boat around. As we wait for the bridge opening, we feel the air get noticeably colder and the bank of clouds to the west overtakes our patches of blue. 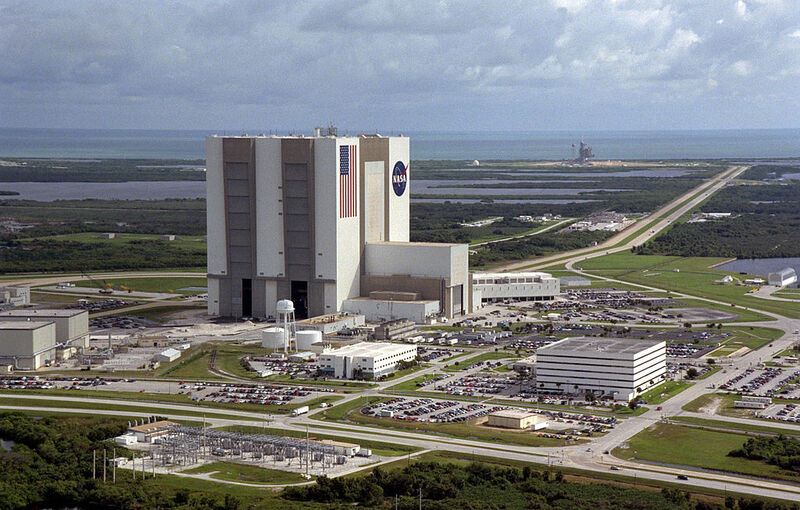 Dominating the landscape as we head south is the huge Vehicle Assembly Building at Kennedy Space Center. It is by far the largest thing on the horizon for many miles. It was built in the late sixties to house the Saturn 5 rocket used in Apollo missions, and is today the largest 1-story building in the world. Just to give a sense of the hugeness, in the picture below, note that the stars in the US flag are each 6 feet tall. The Vehicle Assembly Building at Kennedy Space Center. Our anchorage for the night is in Melbourne, and we find a spot on the west side of the ICW. The skies cleared and we enjoy drinks in the cockpit as the sun sets and the moon rises. We put out the BBQ grill and make a late dinner. I think this is the life; I want to be on the water as the sun sets and fall asleep in the gentle rocking motion of a boat at anchor. This feels like home. 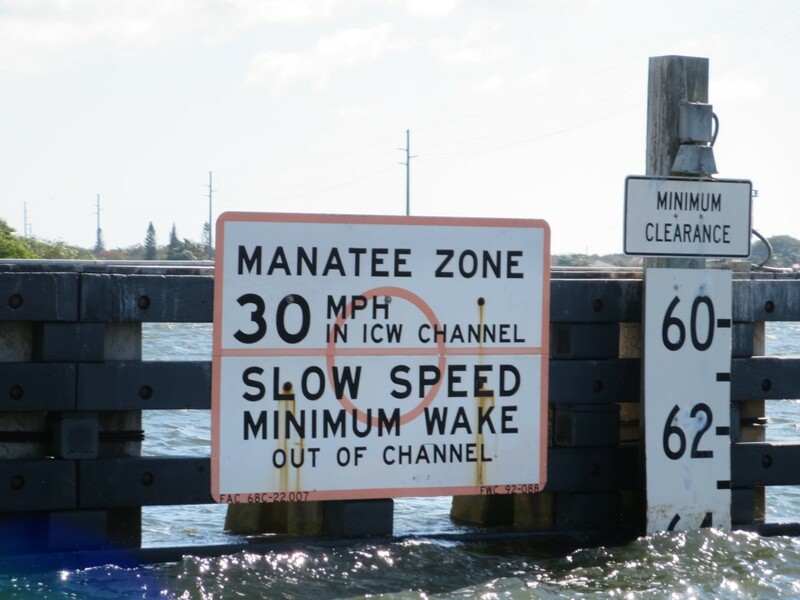 We are seeing manatee warning signs, but no manatees. The next day is bright, clear and warmer. We set out early and make boat breakfast on the way. 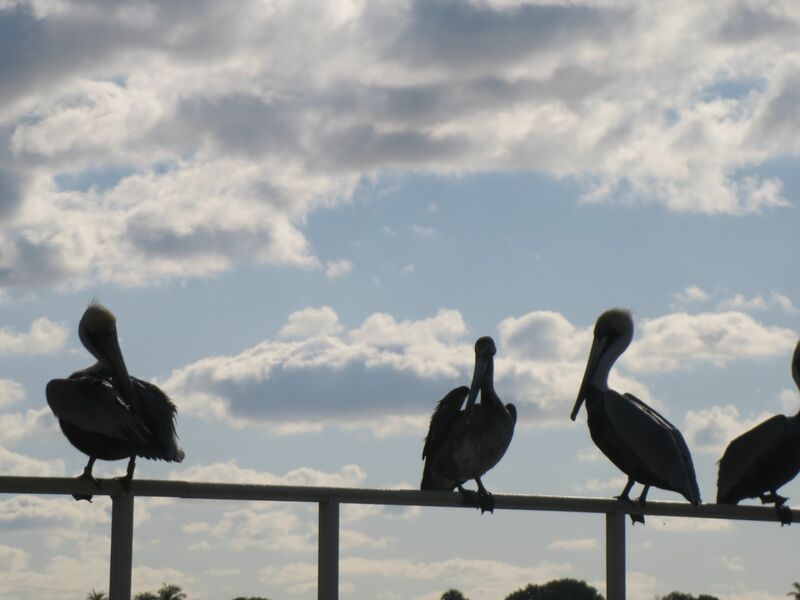 We have to make it to Vero Beach in time to get the car, drive back to Titusville and drive home to Fort Lauderdale – a very long trek at the end of the day. We have traveled 1,000 miles on the ICW. Note the color of the water. We begin notice changes in the water. The deep gray-blue changes here and there to a lighter blue, and we start to notice an aqua hue. Then a light green color shows up in swirls and eddies. I am staring at the water, fascinated by the colors. 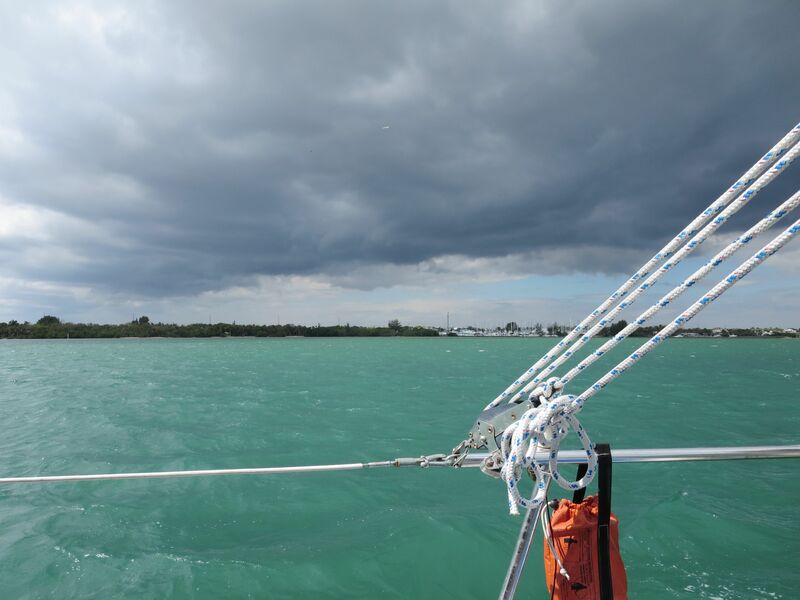 A cold front blows in and changes the water to green. What causes the color of the sea? It could be depth, or shells on the bottom, or the color of the sand. Maybe it is as changeable as the sky, reflecting the gray of rain or the clear blue of cloudless days. I prefer the aqua of the Caribbean, and remember swimming off of Cable Beach in the light blue-green water where we could look down and clearly see our feet. I don’t want a scientific explanation. That might ruin the fascination. Let the colors of the ocean be ever-changing and mysterious.